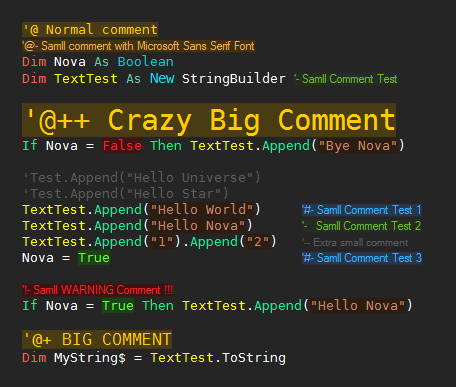 Extension for highlight syntax and comments in Visual Basic. WARNING The default colors are configured for a dark background. I do not remember what improvements I have added during this time, sorry. 1.6.86 is the lastest with VS2015 support. 1.6.16 is the lastest with VS2013 support. New sizes for Subs, Functions and Properties. Solved permanent Red Operators Bug. The matching of the keywords is now less strict. Changed Font for big comments. What's new in 1.5.82: .JR: Comment starts with ! .JR: Comment starts with ? .JR: Comment starts with . 40 = "-JR- (Sub/Function/Prop/Enum) Name"
41 = "-JR- Comment starts with -"
42 = "-JR- Comment starts with +"
43 = "-JR- Comment starts with ''"
44 = "-JR- Comment starts with ++"
and - Changes the size of the comments. When the comment starts with '' it will change the color between two tones of green. 2 = "-JR- Type Ends with C"
3 = "-JR- Type Ends with E"
4 = "-JR- Type Ends with T"
5 = "-JR- Identifier Starts with m"
6 = "-JR- X Y ID Height Width..."
8 = "-JR- Boolean Integer Single..."
11 = "-JR- Class Key"
12 = "-JR- As In"
13 = "-JR- New Return"
14 = "-JR- Dim ReDim Static ByRef"
15 = "-JR- Is IsNot Nothing"
19 = "-JR- Sub Function"
20 = "-JR- For Next ForEach"
21 = "-JR- Standard Keyword"
23 = "-JR- Or And AndAlso"
27 = "-JR- Destruir Dispose"
28 = "-JR- Variable containts: Actual"
29 = "-JR- Starts with Comp"
32 = "-JR- Contains ContainsKey"
33 = "-JR- Count Len Length"
34 = "-JR- InStr InStrRev IndexOf"
35 = "-JR- Trim TrimStart TrimEnd"
36 = "-JR- Mid Substring Split"
37 = "-JR- Add Remove"
39 = "-JR- StartsWith EndsWith"
Some people uses the types ended with "C", "E" and "T", is like some people uses identifier Starts with "m" in private declarations. If you don't use types ended with "C", "E" or "T", don't configure that color.